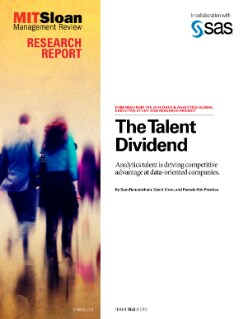 Analytics talent is driving competitive advantage at data-oriented companies. Today’s organizations understand the value of competing with analytics. But this understanding has triggered a demand for analytics talent that far exceeds supply. Many companies are struggling to attract and retain the talent needed to build competitive advantage. This research report explores the success factors of data-oriented companies who are cashing in on their talent dividends. Discover the hallmarks of analytical maturity and see how your plan for developing, cultivating and retaining analytical talent stacks up.